Comcast crews are working full force throughout the Callaway area, and already pockets of customers in this area are seeing their service restored on a daily basis. Comcast expects to be able to restore service for the majority of its Callaway customers by December 14, with restoration of the Springfield and Millville areas to follow shortly thereafter. The Marianna and Sneads areas are now fully restored, although there might be small pocket outages or individual line issues that are tied to a specific address. Our Tech Ops teams remain in the area to handle these individual customer issues. 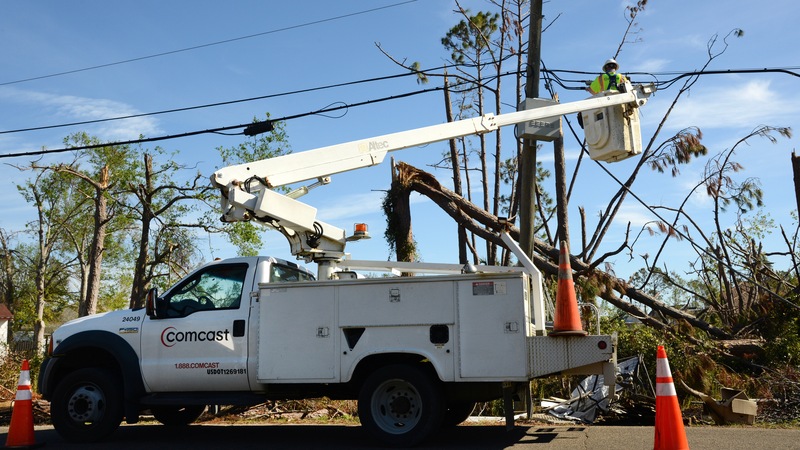 Throughout Panama City, Comcast continues the work to rebuild its new network and crews are finishing the lines and network activation work in the west side of Panama City, Lynn Haven, Pretty Bayou and Hiland Park areas. While the final stages of work continues in these areas, additional crews are also now moving into the downtown area of Panama City and throughout the Cove area. Comcast is planning to bring its Xfinity WiFi hot spot van to the Callaway area and will announce that location soon. For now it remains in the Lynn Haven Walmart Supercenter parking lot daily from 9am – 5pm. The Xfinity WiFi hot spot van provides free wireless internet service to anyone who needs it. The internet service is available and free for both Xfinity customers and non-customers. To date, more than 40,000 individual sessions totaling more than 400,000 minutes of usage have been logged by users of the free Xfinity WiFi van.